The book profiles no fewer than forty writers from Dean Swift and James Clarence Mangan to Brendan Behan and Maeve Binchy. It also includes lists of Suggested Walks and Recommended Reading of the authors’ works. The launch in Dublin’s Alliance Francaise was attended by seventy guests, including Robert Nicholson, curator of the Writers Museum, and Guy St John Williams, grandson of novelist Oliver St John Gogarty. 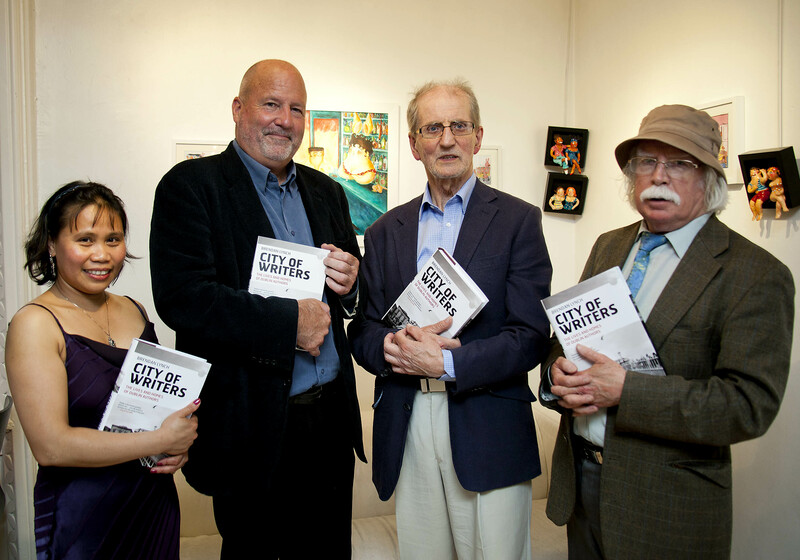 Photo shows (left to right) Mrs Margie Lynch, Liffey Press publisher David Givens, Brendan Lynch and fellow-author, Peter Costello. Speaking earlier to the New Yorker of his own new novel, TransAtlantic, McCann also praised Brendan Lynch’s “Yesterday We Were in America” for its account of the pivotal 1919 transatlantic flight by Alcock and Brown. Brendan Lynch (whose mother’s name was Moore) also revealed at the launch that he is a distant cousin of Ireland’s ‘National Bard’ Thomas Moore, who is profiled in the new book.